Drug form: Gel for external use. Pharmacological Group: Vasoprotectors, Other capillary stabilizing agents. Active substances: Horse Chestnut extract (Aesculus Hippocastanum) – 2 g (contains 20% Aescin); Sweet Clover extract (Melilotus officinalis) – 0,04 g, Gotu Kola extract (Centella Asiatica) – 0,04g. Aiding substances: Dimexide, sodium benzoate, carbomer, mint oil, menthol, glycerol, propylene glycol, distilled water. Pharmacological properties: The pharmacological efficiency of VENOLGEL is defined by combination of 3 extracts which supply and strengthen action of each other and define complex – venotonous, angioprotektive, anti oedema, analgesic effect. Pharmacologic operation of the extract of Horse Chestnut is related to the composition of biologically active agent – aescinum, which has an expressed venotonous action. Extract of Horse Chestnut raises a tone of venous vessels, improves venous blood circulation. At the same time, reduces conductivity of capillaries’ walls, improves microcirculation, has the expressed anti-inflammatory effect. Esculin stimulates antithrombotic activity of serum, increases production of anti-thrombin in the reticuloendothelial system of vessels. Esculin reduces viscosity of blood. Extract of Horse Chestnut slows down ability of blood clotting. Pharmacological operation of the extract of Sweet Clover is associated with the composition of biologically active substances in it: coumarins (0,4-0,9%), coumaric acid, dicumarol, melilotyn, essential oils. Extract of Sweet Clover is characterized by anticoagulative, anticonvulsive, venoprotective and analgesic action during external use. Extract of Gotu Kola has an angioprotective action, greatly improves microcirculation and capillary tonus, it has anti-exudative and reducing action of capillary permeability. Reduction of vascular permeability prevents transfer of protein molecules, electrolytes and water in the adjacent tissues, and as a result of it venous insufficiency symptoms are decreased: swelling of the lower extremities, feeling of heaviness, pain and itching. 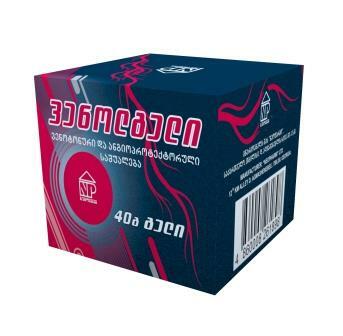 Improves trophism of the connective tissue, ensures its integrity at the expense of the improvement of elasticity of veins. Gotu Kola stimulates the proteolytic activity of macrophagic enzymes and makes liquidation of the main causative reason of edema during venous insufficiency. • Edema after a mastectomy. Contraindications: Individual intolerance of the separate compounding components, pregnancy, lactation period, simultaneous use of anticoagulants. Side effects: Medicine is generally well tolerated by the organism. Allergic reactions can occur in rare cases. Using rule and dosage: It is used externally. Gel needs to be applied on the problem site and to rub in skin, 2-3 times a day. It is recommended to use gel within not less than 2-3 months. Interaction with other drugs: Simultaneous application together with anticoagulants isn't recommended. Influence on ability of driving cars and mechanisms: Taking the preparation doesn’t effect on ability of driving cars and mechanisms. Storage conditions: Store at not more than 25ºC temperature, in a protected from light place, keep away from children. Package: 40g gel in a polymeric material vial. A vial is placed in a carton box with instruction. In case of expiry of validity date, use of the preparation is not permitted. Order of issue from pharmacy: Pharmaceutical product group III. Is issued without prescription. 12th km David Agmashenebeli alley, Tbilisi, Georgia. Tel/fax: +995 (032) 259-64-46, 259-57-90.